► The risk factors for a heart attack and/or stroke. ► Information about normal heart and lung function. ► How to recognize a life-threatening emergency. ► When and how to properly activate the emergency medical services (EMS) system. ► How to make a difference in the outcome of emergencies. 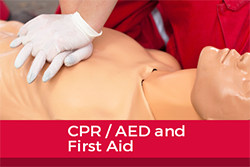 ► How to provide basic life support (BLS). ► What to do in the case of an airway obstruction (choking). ► How to provide care for a life-threatening bleeding emergency. ► How to provide basic care for someone who may be in shock. ► And more, sign up today! If your company has 8-10 or more employees that need training, call us and we can come to your facility. Cancellations less than 24 hours in advance and No-shows are responsible for the full registration fees. Substitutions may be made at any time.